The Dark Below is the first DLC for Destiny and includes several story missions, new strikes and a brand new Raid called Crota's End. Along with new Crucible maps, the content is backed up with a nice collection of new Exotic weapons and armour, along with new Raid gear to reach Level 32. Note: This post will be updated as new information is released. Costing $20 and due for release on the 9th December 2014, the first Destiny DLC caters to both low and high level players. Low level players can progress their characters further by directly purchasing Level 30 gear through existing vendors. 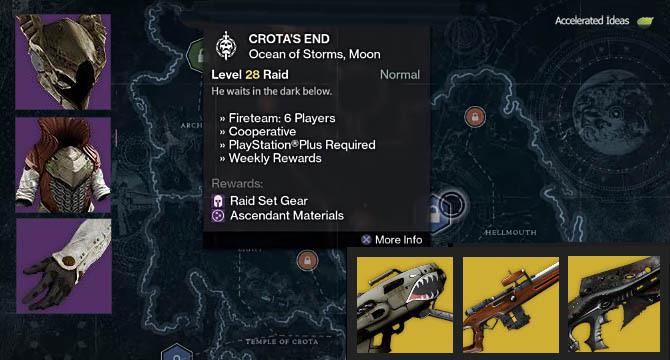 Whereas high level players can take the ultimate challenge and compete in the new Moon Raid as they seek to earn new Raid gear. Bungie have confirmed that the max Light Level of 30 will be increased to 32 in this DLC. Players can earn Raid gear to push their Armour light stats above 30 but they can also buy new Legendary armour to reach level 31. Drops during the Raid will be random and chests will be strategically placed before checkpoints so they'll be no quick wins. A new currency called a "Commendation" is required before players can purchase the high level Legendary weapons and armour from the Vanguard, Crucible and Faction Vendors. Read more about Commendations. It's worth noting that the purchasable vendor armour is stronger than the pre-DLC Vault of Glass armour but weaker than the Crota's End DLC armour. Eris, the new Tower Vendor offers players "story like" quests and bounties to earn additional rewards that include free Legendary weapons and armour. She offers material exchange to some of the Dark Below materials such as the Embalming Orb and Runed Core. 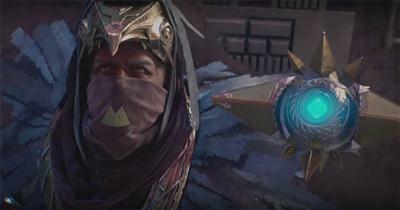 Read more about Eris weapons, quests and materials. A preview of the Dark Below from Game Informer revealed that upgrading Exotic armour to level 32 will require you to reset all stats on the armour piece in return for a higher base stat. See full details on how to reach Light Level 32. Interestingly, the Hard mode for the Crota's End Raid is actually set at Level 32, well above the average level for most players. Just as with VoG, several runs on Normal mode will be the precursor before any attempts to master the Hard Mode are possible. The Hard mode is locked until January of 2015. Also of interest, several new Exotic Weapons and Armour are included in the Dark Below DLC. Exotic items are the highest class of item in the game, offering unique abilities and traits such as full auto hand cannons and auto reloading sniper rifles to name just two. Further down you'll see a list of the new Exotic weapons which are (predicted to be) included in the Dark Below DLC. Some of the methods for acquiring the new Exotic weapons and armour will be similar to before; RNG, purchasing from Xur and earning them from Exotic Bounties. However, there is a big change to the way some Exotic weapons are acquired. Rather than earning an outright Exotic weapon, you'll need to upgrade certain Common weapons to Legendary and then through to Exotic. Upgrading in this way requires heaps of Black Wax Idols and a special Raid drop known as the Crux of Crota. The screenshot below shows the official images of the new armour and weapons included in the DLC. An ARC damage auto rifle, the Necrochasm comes with the label: "Eternity is very close. Can you feel yourself slipping?" One of its unique upgrades, known as Cursebringer, will cause the enemy to explode when you get precision kills. If you think back to Icebreaker, that weapon had a similar upgrade that caused enemies to explode. The big difference here is that we're talking about an auto rifle so precision kills are going to be far more common - thus possibly making the Necrochasm the new Suros replacement. The Necrochasm is the end game weapon for this DLC, putting it on par with the Vex Mythoclast. Learn how to get the Necrochasm. Looking like some kind of futuristic elephant gun, No Land Beyond is a Kinetic damage sniper rifle which can occupy the primary weapon slot. This sniper rifle has the following label: "Every hit blazes the path to our reclamation". The high level upgrade called "The Master" means that kills briefly increase damage against next target. No Land Beyond is a disappointing weapon to say the least. Although it's a high impact sniper rifle, it's slow reload speed and low ammo reserve put it well behind the Ice Breaker and even other Legendary weapons of the same class. Original called Devil's Due, The 4th Horseman is an exotic shotgun which is exclusive to Playstation. The weapon inflicts Arc damage and can be fired in full auto mode. "Final Round" and "Return to Sender" upgrades allow this weapon to inflict more damage on its final round and additionally return ammo upon kills. This weapons has the label: "It's not a holdout weapon, it's a pathfinder". A solar damage rocket launcher. Dragons Breath has the label: "Burn the world. Burn it all". One of the upgrades for this weapon, known as Tripod, allows the launchers tube to hold 3 shells, meaning that no reload is required whilst you fire off those 3 rockets. The best high level upgrade for Dragons Breath is called "Pyromancer" in which rounds fired from this weapon leave a Solar Flare upon detonation. Any enemies susceptible to Solar damage are really going to feel the pain from Dragons Breath. Perk: Blessing of Light and Weapons of Light last longer. Perk: Activating Radiance from death disorients nearby enemies. "Advanced tactical sensorium. Induced hallucinations integrate broad-spectrum targeting data". Perk: Your Golden Gun zooms in for accuracy when aimed. "13.4 billion years ago, the first stars kindled out of darkness, seeding the future of all life." Park: Gain an extra Fusion Grenade. "In the Garden grows a tree of silver wings. The leaves are ruin, the bark disaster. Of the seeds we do not speak." Perk: Heavy ammo drops are more frequent and they contain more ammo in each drop. "Look at all this life, oh bearer mine. There is so much left to burn...". Perk: Gain an additional charge for Scorch and Energy Drain. "Amputated from a creature that stumbled out of a Vex gate. A vestigial defensive reflex still remains." Perk: Taking damage from a melee attack makes you briefly invisible. Perk: Increases the duration Shoulder Charge remains active. "Built for swift movement, they provide unexpected and decisive social benefits." Perk: You move more quickly while aiming your weapon. In addition to the collection of Exotic gear, there's a full set of Legendary armour for each of the classes. Split into two categories, Tier 1 and Tier 2, the quality rating of this gear is higher than that from the Vault of Glass - meaning that Light Levels can be pushed towards Level 32. 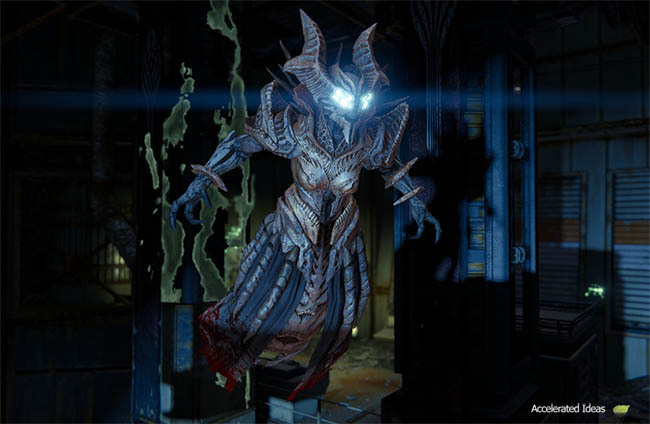 The Crota's End Raid takes place on the Moon where you'll face Hive enemies rather than the Vex from Venus. The Raid level has been increased to 30 for Normal and 32 for Hard mode. Damage penalties will mean that players below level 30 will have no hope of completing Hard mode unless carried by higher level allies. As with the VoG, the new Crota's End raid rewards players with raid specific weapons designed to cause maximum damage to Hive enemies. They're all themed to match the Hive's appearance with jagged edges and glowing green spots. 1 x strike called "The Will of Crota"
1 x Raid called "Crota's End"